By now, most Thanksgiving dinner plans have been made and we're all working on finishing touches, like how to make our Thanksgiving tables look their best. If you aren't going to go the napkin/napkin ring route, you can always use some creative folding to add a little extra wow to the table. I know that the time to host family and friends for cozy dinners and parties is upon us, so I thought it would be a good idea to make some napkin rings to make place settings a little more festive. Read on to make this VERY easy project! And, over at ManMadeDIY, we're also giving away a really nice Craftsman Miter Saw, so you can double your chances to win (well, I'm not a statistician, not maybe not really, but come on). Last weekend, our own Chris Gardner was on a fun online TV called the Craftsman Experience, showing off his mad tooling skills, so we're excited to let you have a chance to win one for yourself. Read on to find out how to enter both giveaways! 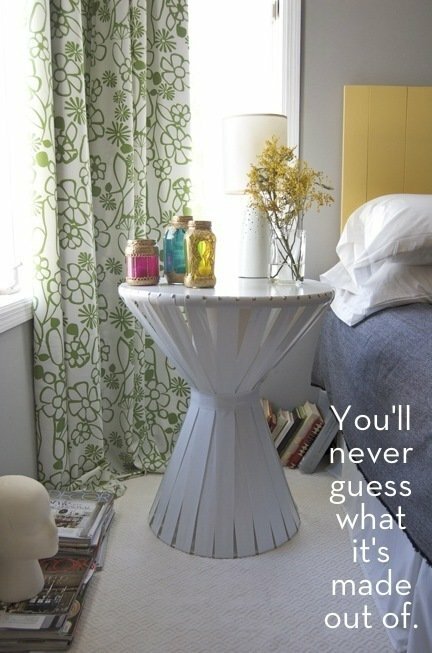 Katie needed a bedside table, so like any resourceful DIYer, she made one. And you'll never guess what she used to get the job done. Over the last month, we've been giving some love to our favorite room in the house ... our porch. Earlier this month we spruced up our porch coffee tables and a rocking chair. Then we kept the momentum going and re-did some candle-holders. This week's project was both functional and fun, and we were thrilled with the results. We've seen stumps and branches turned into stools and side tables, as well as accessories like desk organizers, magnets, and napkin rings, but can a hunk o' tree stand it's own as a room-centering piece like a coffee table? Xan and Pablo took a beer keg, much like the one pictured above, and turned it into one of the coolest side tables ever. Complete with a glass top and, of course, a tap. How do I upcycle cardboard boxes to make something useful or beautiful? A door that turns into a ping-pong table? The “Paint or Die But Love Me” Table designed by John Nouanesing seems to be melting or dripping paint. This conceptual table is one of the coolest I've ever seen! Wood pallets are an unfortunate bystander of our everyday shipping needs. But luckily wood is extremely recyclable and these four pallets were able to turned into a rustic DIY dining table. Who doesn't love a good pictorial how-to? Especially this time of year when you don't have time to read all the deets.